This new build by Cresta Ridge Homes really works for a family of four. They needed lots of open space to get together at the end of the school day and on weekends. This project for us was about creating a functional, cohesive space and providing plenty of custom designed storage and organizational options in the home. Function and storage was of paramount importance in the large kitchen and pantry. We designed the cabinetry and worked with Perfection Millwork throughout the manufacturing and installation process. Integrated appliances and hood fan create a seamless feel while the large island is a gathering place for family meals and homework. The selection of soft, soothing finishes and colors promotes a balanced feel in the heart of this home. The wallpaper and fireplace create an interesting focal point . The furniture was purchased with an eye to a balanced, relaxing space with durable surfaces so the family can kick back together. The layering of accessories add a punch of color and help pull the room together. This U-shaped kitchen is designed with functional work space & storage in mind. 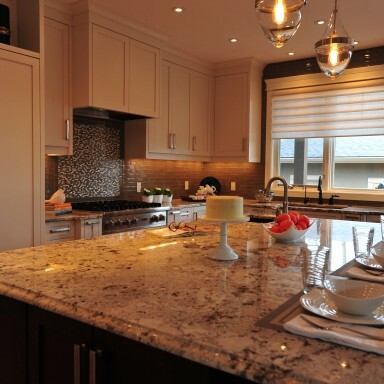 The large island is creates a functional work zone as well as a place for family meals. Baking is a hobby so double wall ovens and a baking centre in the island are handy when the family works together as are the large single basin sink and prep sink. Custom designed cabinets seamlessly work with the large integrated fridge-freezer and hood fan. 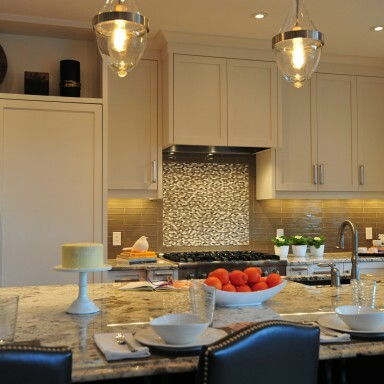 A custom glass back-splash is a neutral, subtle finish that is harmonious in the space. Leather bar stools with nail head detail complete this family friendly counter height bar. The space was staged and accessorized by PCD. This kitchen cabinet storage and island were designed with functional work zones and maximum storage in mind. Integrated appliances and custom cabinets in a neutral, lacquered finish are harmonious and easy to care for. A large walk-in pantry offers maximum of storage for this family of four. Space and storage make this great room a functional and comfortable place for the family to kick back together. 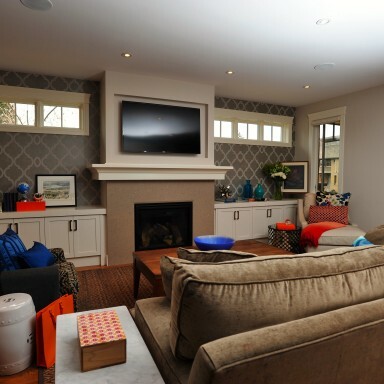 The graphic wall paper and fireplace offer a focal point. Interior finishes and design elements in grays and neutrals create a balanced, harmonious look and feel. Furnishings were selected that are stylish, durable and family friendly. A splash of color in the accessories bring life and cohesion to the room. The furniture, staging & accessories are by PCD.